Director – James Hill, Screenplay – Jane Baker, Pip Baker & R. Wright Campbell, Producer – Bertram Ostrer, Photography – Alan Hume, Underwater Photography – Egil Wexholt, Music – Walter Stott, Music Conductor – Maurice Dods, Special Effects – Richard Conway, George Gibbs & Jack Mills, Production Design – Bill Andrews. Production Company – A Bertram Ostrer-Steven Pallos Production. Passengers are forced to abandon a sailing ship when it is wrecked in a storm. They are rescued by Captain Nemo in The Nautilus. Captain Nemo takes them to Templemer, a fabulous domed underwater city that he has built. He then informs them that they will have to spend the rest of their lives there, he not wanting the world to discover his advanced technological secrets. When it is discovered that Captain Nemo is building a second Nautilus, the group make plans to escape, some simply wanting freedom, others to steal Nemo’s plentiful supplies of gold. Captain Nemo and the Underwater City has clearly been conceived in the shadow of Disney’s vastly superior 20,000 Leagues Under the Sea (1954). 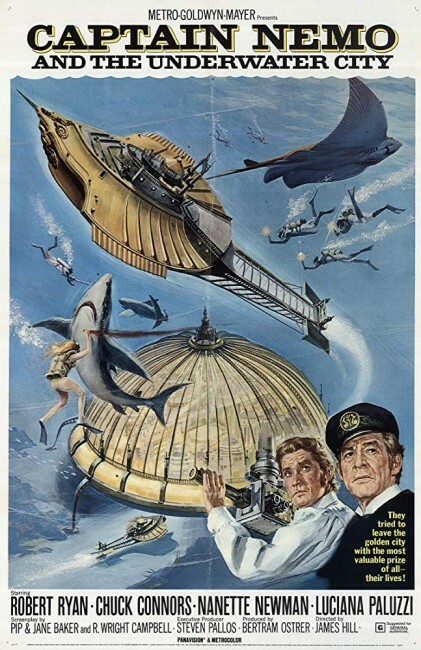 This film copies many scenes wholesale from 20,000 Leagues Under the Sea – the prisoners disgust at Captain Nemo’s sea-food specials, the desire to obtain his gold, the underwater farming scenes, an attack by a giant sea creature (a manta ray instead of an octopus) and so on. However, Captain Nemo and the Underwater City lacks any of the original’s grand adventure and is a dull juvenile piece. A large part of the reason for this is the fault of Robert Ryan (a dead ringer for actor Ian McKellen) whose drearily dull performance robs the character of Nemo of any complexity. As opposed to both Disney and Jules Verne’s characterisation of Captain Nemo as a melancholic militantly pacifistic inventor, the film reduces Captain Nemo to little more than a comic-book villain/scientist. Instead of being a Victorian inventor who has with an acceptable stretch of plausibility built a submarine, Captain Nemo here has gone so far as to construct entire underwater cities, something we have yet to do over a century later. (This characterisation of Nemo as super-inventor would become even more ridiculous with Irwin Allen’s subsequent The Amazing Captain Nemo ). Particularly silly is the production design – all designed for Cinemascope spectacle – with fish-shaped microphones, crab alarm bells and preposterously colourful costumes including diving suits with little transparent wings on them and Nemo’s suit that comes emblazoned with a ‘N’. 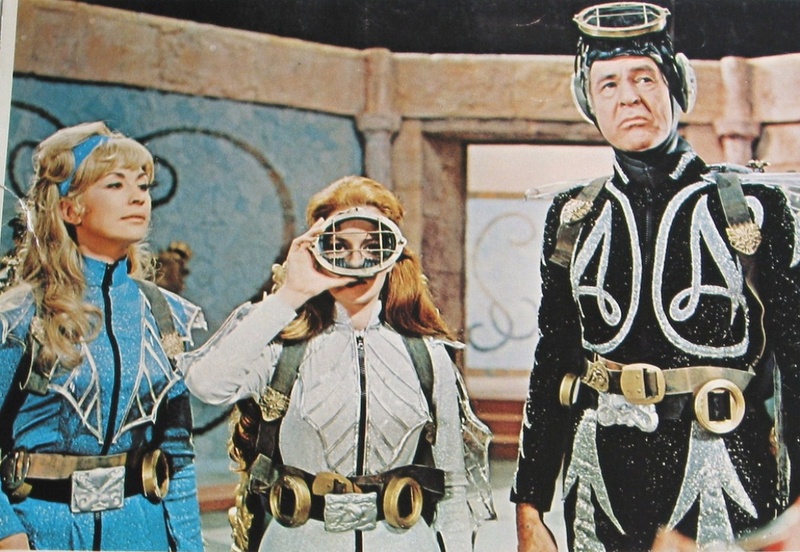 It is a gimmicky silliness that turns Captain Nemo into a villain more appropriate to the Batman (1966-8) tv series. Furthermore, there is a clear pandering to a slapstick tone with buffoonish supporting characters and the score turning to cartoonish sound effects whenever they are around. If anything, this makes Captain Nemo and the Underwater City into a children’s version of 20,000 Leagues Under the Sea, one that is more akin to one of the numerous Jules Verne adaptations that came out after the success of 20,000 Leagues – the likes of Around the World in 80 Days (1956), Journey to the Center of the Earth (1959), Five Weeks in a Balloon (1962), Jules Verne’s Rocket to the Moon/Blast Off/Those Fantastic Flying Fools (1967) – all of which played Verne up as colourfully silly spectacle. The film is dully directed and the special effects only so-so, with a not terribly convincing model sailing ship at the start. The script comes from R. Wright Campbell, a minor science-fiction author who also wrote Roger Corman’s Teenage Caveman (1958) and The Masque of the Red Death (1964), and Pip and Jane Baker, who were responsible for some of the worst episodes of tv’s Doctor Who (1963-89).